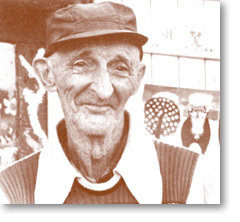 Husband of Maud Lewis, Everett worked as a farm labourer and fish peddler in his early years. After marrying Maud Dowley in 1938, he went to work as a night watchman at the Marshalltown Poor Farm. It was Everett who encouraged Maud to paint and he bought her first set of oils. Because of Maud Lewis' rheumatoid arthritis, she was unable to do the housework. Everett took care of the house and Maud brought in money from her paintings. As Maud got older and her physical condition deteriorated and her hands got worse, her popularity grew and demands on her to produce work were at their greatest. 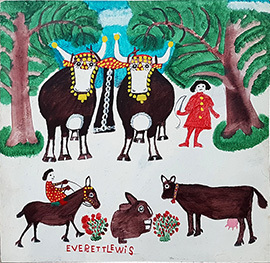 To facilitate productivity, Everett got her to draw oxen on cardboard and cut out templates for her to use in her paintings. After his retirement he made his own horse templates and began to paint maritime scenes and landscapes with animals and other subjects. Everett was killed when a burglar murdered him during attempted robbery at the house in 1979. Ref: Marie Ellwood, Folk Art of Nova Scotia (1976); Kobayashi/Bird - A Compendium of Canadian Folk Artists (1985); Blake McKendry, An Illustrated Companion to Canadian Folk Art (1999).